With a heap of years under this New York metal acts belt one would think Anthrax would have taken a break from the rigors of touring and recording. Not Scott and the boys. Anthrax blast back into the shopping racks with one hell of a DVD/CD release that shows them truly at their finest, live. Anthrax may seem a little behind the times in the metal realm but one must remember they were a large contributor to what helped establish the bands we have all come to love. Capturing Anthrax live in the now Chicago’s legendary Metro, MUSIC FOR MASS DESTRUCTION is a lasting impression of how Chicago may be the metal capitol of America.With 16 tracks spanning much of their careers, this DVD is a virtual blender of classic and recent chugging guitar power metal tracks sure to bring back all the flashbacks of a time when moshing wasn’t such a testosterone driven nightmare. Being witness to Anthrax at Chicago’s House Of Blues just months before the recording of this release, Music For Mass Destruction does an incredible job at showing how devoted Anthrax are to the windy city. With the recent departure of long time bassist Frankie Bello Anthrax seem to be on a slow demise and some things are just better put to rest some would say. With this in mind Music For Mass Destruction is a very good memory sake for Bello as well as a great way of showing Anthrax can still pummel most modern metal artists with little effort. Like most music DVD’s Music For Mass Destruction is packed with extras including behind the scenes footage recorded at the Machine Shop in Flint Michigan. Another great feature is a visit to comic artists extraordinaire Brent H. Thompson house. 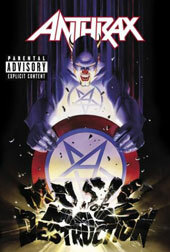 Brent is the illustrator for the cover of the new Anthrax release as well as this DVD. Oh yea I forgot, this DVD also contains a cd with a selection of tracks from the show featured on Music For Mass Destruction giving you even more bang for your green backs.